Trainer Philip Hobbs welcomed his first winner of The Irish Independent Arkle Challenge Trophy when Captain Chris scored well under Richard Johnson. Good ground and a breathing operation were factors in enabling the winner to reverse form with such as Ghizao and Medermit, who proved his superior earlier in the season. Hobbs said: “It’s good to have one in the bag. He’s improved throughout the past year and could get better. 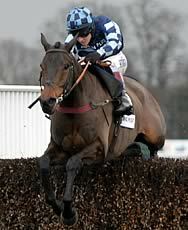 Hobbs had pondered running both Captain Chris and Wishfull Thinking in Thursday’s Jewson Novices’ Chase. He said: “Captain Chris would have run very well in that contest, and we were tempted to run both to give us two chances, but we’ve gone for glory in a bid to win both races. Johnson said: “I’m hoping there’s a lot more to come, because ground is very important to him and he only had the wind op at Christmas. I believe his confidence will grow and grow - he could be very special. “To be fair, he is quite inexperienced. Thirteen months ago he was running in bumpers, and he’s done a lot in a short space of time. The owners were patient before he got to a racecourse and they’ve reaped the benefit now. “The better ground has definitely been a big help. He has done very little wrong and every race he has run in has been a high-class one. It was getting frustrating to finish second all the time but now he has won his last two. Paddy Power make Captain Chris a 25/1 shot for next year’s totesport Gold Cup, and 14/1 for the 2012 sportingbet.com Queen Mother Champion Chase. Graham Whateley, husband of winning owner Diana, explained how they came to decide with trainer Philip Hobbs which races to go for with their good novice chasers Captain Chris and WishfullThinking. At one stage it looked like both would go for the new Grade Two Jewson Novices’ Chase over two and a half miles at The Festival - the opener on day three. Whateley explained how plans changed: “I said let’s do a SWOT analysis, strengths, weaknesses, opportunities and threats. And we decided to split the horses - it is a sporting occasion. We wanted to take our chances and we did. “Captain Chris is a great horse and my wife is very lucky to own him and Wishfull Thinking - I couldn’t split them and I don’t think that anyone else could either. We have got two and let’s just hope that the luck stays with us. “I have tried to remain relaxed all day. I walked the course with my wife last night at about seven o’clock - it was just the two of us with our labrador and we relaxed and thoroughly enjoyed it. I made us a cup of tea this morning and we just wished ourselves good luck. It was the Whateley’s second Festival success after Menorah in the opener last year, the Stan James Supreme Novices Hurdle. Owner Michael Buckley and Nicky Henderson, who finished runner-up in the opening race with Spirit Son, had again to settle for second in The Irish Independent Arkle Chase when Finian’s Rainbow lost out to Captain Chris. “I’d be lying if I said I wasn’t a bit disappointed,” said Buckley. “The horse probably does a bit too much early on but he jumped magnificently and ran a wonderful race. I’ve no complaints, we just found one too good. Trainer Noel Meade was happy with Realth Dubh’s effort to come third. “Everyone likes to win but I was happy that he ran well,” said Meade. “He jumped well and was just not good enough. He had a lovely run around the inner and although he could have jumped the last two better, that was probably because he was going as quick as he could. 1. The Arkle Challenge Trophy was inaugurated in 1969, after Arkle’s three wins in the Cheltenham Gold Cup (1964-66). In its first year, the race was worth £1,365, and was won by Chatham (10/1), trained by Fred Rimell and ridden by Terry Biddlecombe. The 2010 running has total prize money of £130,000. It was known as the Cotswold Chase before 1969. 2. The Irish Independent, which backed the Arkle Chase for the first time in 2000, is only the race’s third sponsor. Guinness sponsored from 1994 until 1999, having taken over from Waterford Castle, who had supported since the first sponsored running in 1991. 3. The Irish Independent Arkle Chase has always been a fiercely contested event, and the following have gone on to other Championship victories at The Festival: 2006 Voy Por Ustedes (Seasons Holidays Queen Mother Champion Chase winner 2007) 2003 Azertyuiop (Queen Mother Champion Chase winner 2004) 2002 Moscow Flyer (Queen Mother Champion Chase winner 2003 & 2005) 1999 Flagship Uberalles (Queen Mother Champion Chase winner 2002) 1995 Klairon Davis (Queen Mother Champion Chase winner 1996) 1991 Remittance Man (Queen Mother Champion Chase winner 1992) 1978 Alverton (Tote Cheltenham Gold Cup winner 1979). Alverton is the only horse to have won both The Irish Independent Arkle Chase and totesport Cheltenham Gold Cup. 4. The lowest number of runners has been eight (1979, 1984 & 1993) and the highest 19 (1987 & 2005) as the Arkle Chase -there were 25 runners in the Cotswold Chase in 1960. The current safety limit is 20. 5. The Irish Independent Arkle Chase has seen several trainers and jockeys run up strings of wins. Martin Pipe notched up successive wins with Or Royal in 1997 and Champleve in 1998 before Well Chief in 2004 and Contraband a year later gave him another brace of victories. Peter Easterby trained three winners -Alverton 1978, Clayside 1981 and Ryeman 1983. Among current trainers, Nicky Henderson leads the way with three successes (Remittance Man 1991, Travado 1993 and Tiutchev 2000), while both Paul Nicholls (Flagship Uberalles in 1999 and Azertyuiop in 2003) and Alan King, successful with My Way De Solzen in 2007 and Voy Por Ustedes in 2006, boast a pair of victories. Among jockeys, Jamie Osborne won three times, via a hat-trick between 1992 and 1994 on Young Pokey, Travado, and Nakir for three different trainers, Oliver Sherwood, Nicky Henderson and Simon Christian. Tony McCoy equalled Osborne’s three wins in 2004 when scoring on Well Chief, having also been aboard Or Royal (1997) and Champleve (1998). 6. Irish trainers have won The Irish Independent Arkle Chase 11 times, including five of the last 15 runnings with Klairon Davis (1995), Ventana Canyon (1996), Moscow Flyer (2002), Forpadydeplasterer (2009) and Sizing Europe (2010). 7. The longest-priced winner is Gala’s Image, successful at 25/1 in 1987, while Pendil (1972) and Chinrullah (1979) are the shortest-priced scorers at 10/11. Six other favourites have won -Canasta Lad (1974), Clayside (1981), Bobsline (1984), Remittance Man (1991), Klairon Davis (1995) and Azertyuiop (2003). 8. The fastest time for the two miles of The Irish Independent Arkle Chase was 3m 46.5s by Tiutchev in 2000, beating the previous best of 3m 52.5s set by Or Royal in 1997. 9. Until 1980, The Irish Independent Arkle Chase was always run on the Wednesday of the National Hunt Festival. It now takes place on the opening day, Tuesday.